A sleeper sofa or a sofa bed is a couch that has a metal frame and a thin mattress underneath its cushions. It can be unfolded or opened up to make a bed. They come in different sizes and styles. They are categorized from chair sleepers to queen sleepers. Sofa beds are usually three sitter couches but you can also find them in two-person couches. The best sleeper sofa is determined by a number of things that one has to consider before buying one. Sofa beds save on space. This is because they have dual purposes of being a couch and a bed. They are ideal for homes that have limited space and in apartments that have a challenge in adjusting regular furniture. Sofa beds are the best solution for people who love to entertain guests. They are great for guests who regularly sleep over. 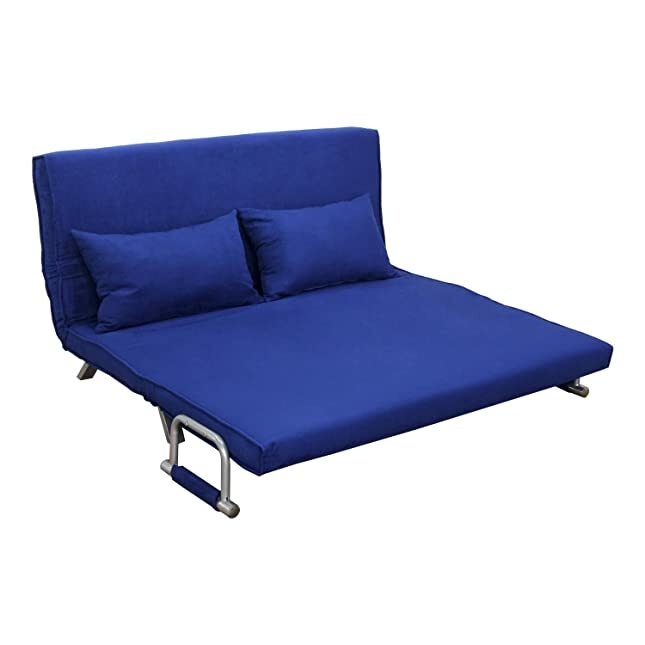 The best type of sofa bed for this is one that comes with a mattress for your guest to enjoy a good night’s sleep. Sleeper sofas that have a sleek appearance serve the living room as a regular couch. There are many styles and designs that are available in the market for one to choose from to adorn their living room. A sleeper bed that has got a beautiful appearance allows you to save space without sacrificing the beauty of your living room. It will do both at the same time. Many sofa beds come with a storage space that allows you to store items in a more organized way. The sofa bed will make your home tidy and clutter free. Sleeper sofas save you money. Having a guest bed and couch as one item means that you do not have to buy another piece of furniture. 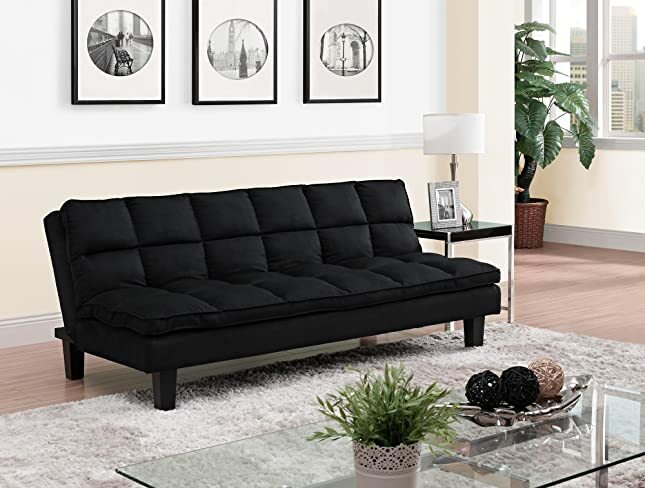 DHP Emily Convertible Line Futon sleeper sofa converts easily from sitting to sleeping and lounging. I have used this sofa in my office and it is comfortable for sleeping. During the day I easily convert it back to a sitting sofa and I even use it for a meeting with my business partners who visit my office. This DHP sleeper sofa can be paired with an Emily chaise lounge for you to have a queen size sleeping space. With this space it can even hold two people at the same time. I have had my kids sleep on it and they fit comfortably. It has a split back. It allows them to be set separately from each other or even lay flat. You can have it as two separate sofas are combine them together. It has a modern outlook. 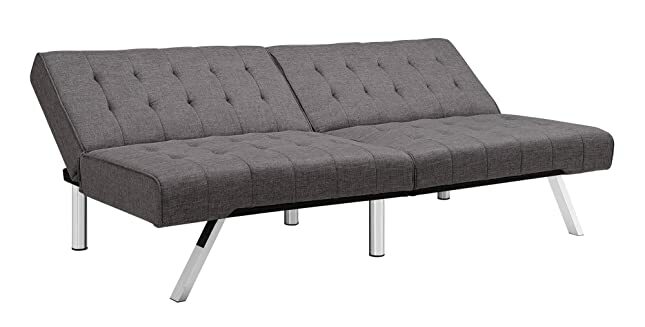 This allows the futon to blend well in a living space. It has given my house a modern and sleek appeal. I also use it in my coffee space and I can move it to any room. It goes along with that modern outlook. The legs are made of metal with a chrome design. For the time I have had it, the legs are still intact and are mot shaky. My floor has had no scratches due to the shape of the legs. Comes in black and vanilla colors of faux leather material. Navy and gray colors are available in linen. These colors are amazing. They do not show dirt easily and who does not love leather. They blend quite easily and are also easy to clean. Very easy to set up and assemble. The frames are made of sturdy wood which ensures durability and comfort. No shaking or squeaking. Modern design that makes the home look beautiful. Though it is comfortable, it is a bit hard for one to sleep on it for consecutive days. Intex Pull Out is a two seater sofa that can be folded or stretched into a sleeper sofa. Pulling out and folding it back is easy and requires little or no effort. It has cup holders for you to place bottles. Remote controls or glasses. I have relaxed on this sofa and it is very convenient. You don’t have to reach out on the table to place something. You can inflate it to your desired size. Deflating also takes very few minutes and it can be easily folded for transportation. Using it outdoors is my best part. It is made of strong PVC and thick vinyl, which is less likely to get punctured. This also makes it durable and strong. When inflated it can be pulled out as a queen size mattress or pushed back into a sofa easily. It is versatile and great for sleeping or lounging. Preventing water from destroying the inner pillow. It is good for pet lovers since urine and fur do not mess the sofa. Easy to clean with a damp sponge and wipe. It is too low and has a strange smell for first time users. It has 3 different sections that have to be inflated. The pillow top cushions are made of foam. This ensures long lasting support and durability. Sitting and lying on the cushions gives absolute comfort. The futon is upholstered with black microfiber. When I bought this chair it blended well with the room décor. Black is just my color and I love this futon. The back of the futon is adjustable. I easily convert it into a lounger when I invite my friends and to a sleeper for those who sleep over. This futon is versatile. It can be used in the living room as I do. I have seen my colleagues who use it in their office spaces. The seats are also foam padded adding to its comfortability. You do not have to add a mattress on the top for your guests to sleep. The frames are made of sturdy wood. For the months I have used it, I have not felt it shake or squeak despite its everyday use. It is durable due to the use of sturdy wood for the frames. It saves on space as it is easy to convert it into a sleeper. Cleaning it is not a problem. You only need a damp cloth to wipe clean. Easy to set up and assemble the futon. It is not ideal for tall persons since it is a little bit short and is also not ideal for pet owners. Sofa beds mostly had spring mattresses which had creaky springs that would wake you up. Today, sleeper sofas have memory foam and air/innerspring hybrids. These have some air inflated above the traditional spring style mattress so as to make it much thicker. They make the sofa bed much more comfortable when sleeping on them. It is also important to test for the quality of the mattress. It should be comfortable to lie on. Manufactures make sleeper sofa mattresses that have comfortable padding that is added to the top. This makes them much more comfortable to sleep on. They are placed on top of the existing mattress to reduce tension, provide support and improve circulation. Ensure that the space provided for the sofa bed is enough for it to be fully extended. This will help to avoid the moving of furniture every time you need to open it up. Have in mind the size you what, since sleeper sofas don’t come in one size. They come in queen or full mattress options, twin or king size mattresses. A sleeper sofa is generally a couch that has a mattress inside it. This can make the entire product very heavy. You can choose to go for the inflatable mattress that will be lighter and easy to move when you need to do so. The frame is a key part of the sofa bed. Look for kiln-dried hardwood frames. Kiln drying ensures that the wood is free from moisture and the wood is also stable and it does not crack or warp. This is essential for sofa beds with movable parts. Strong metal frames can also work for the more modern designs. Having a sofa bed that matches with the décor of your home creates a good appeal. When using it in the living room, the sofa bed will serve as a centerpiece. For this, you can choose a traditional pull out leather sofa bed. For the guest room, you can choose to go for some flair that has convertible bed covered in a color of your choice. Is your sleeper bed going to be more of a bed or a sofa? If it is going to be more of a sofa, try to get one that has cushioned armrest and a more rounded backrest. If it will be more of a bed, go for one that has a mattress with high-density foam or spring coil. You can also look for a sofa bed that has storage space for the beddings to maximize on space. Cushions that are overstuffed will look casual and comfortable. Tailored cushions will look sophisticated. A sofa bed will have a great mix of tailored bottom cushions while the top pillows will be loose making it look stylish. You can also have complete relaxation while watching TV or reading book with a best reading pillow. A good sleeper sofa should lift up and out in open and close mechanism. This should be smooth without squeaking and sticking. Designs that have a lock-down bar are the best. Ensure the closing and opening parts are put well together such that they will not break or loosen easily. Look for a sofa bed with high quality material such that it will not tear and wear out easily due to pressure. The material should be durable and free from absorption of dirt as well as appealing to the eyes. This is because a sofa bed will have a multiple of uses and it has to give you service. A good sleeper sofa should have smooth edges so as the sheets and blankets do not catch and rip. This will ensure that your blankets and sheets remain in good condition. It is advisable to remove the sheets and blankets before closing the sofa bed. This will help to reduce the chances of parts of the bed shifting in terms of alignment. A quality sofa bed will be pricey unless you are buying a used or small scale sleeper bed. It is important to look for a sofa bed that is within your budget range that will give you the service you need without disappointing you. In conclusion, having a sofa bed is a way to save space and money. With the many sofa beds available in the market, it is easy to find one that will blend well in your home. The important thing is to know what you want.